I know I am late reporting this but it came right after I declared my hiatus for the blog for the Amsterdam trip. If you are not familiar with "Dewey defeats Truman" do visit it here. Same thing happened to poor Newsweek which did two issues, one for Trump and one for Hillary as presidents. 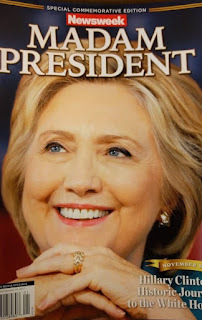 At a certain point signals were heading towards Clinton winning prompting kiosks to start selling that edition by the time the results were out it was too late to retrieve the copies which were already in the market already sold. Oh well, in Arabic we say "mish sa7i7 fel mnih" - not true, but could be a good omen. Though I doubt at this stage!